Oh my, was this good! The Tomato Gorgonzola Salad and the BBQ Potato, Bacon and Corn Salad was the perfect accompaniment. This recipe was adapted from "Cooking Light"
Combine first four ingredients in a large ziplock bag. Add steak, turn to coat; marinate for 30 minutes at room temperature. Grill until desired doneness. Let stand, covered loosely with foil for 10 minutes, before cutting in thin strips against the grain. What does "T." mean, as in "1 T. Worcestershire sauce"? Perfect! This was absolutely cooked to perfection and so flavorful! Trying Shrimp Alfredo tonight. OMG! This recipe is GREAT. I am so glad that we found you on Pinterest. I've also just used bottled Balsamic Vinegar salad dressing instead of mixing it up and it is fabulous! So, so delicious! Thanks for such a great, easy marinade. We had the missionaries from our church over for dinner, a few of our kid's friends plus our large family of 10 and this was a hit with everyone! Can't wait to try more of your recipes! Thank you, Heather. I am glad your family and your guests enjoyed this recipe! This looks amazing! I am so glad that I found your site. I am always looking for healthier meals to feed my family. I love that you put the weight watchers points on your recipes. I don't have a grill, how else can you cook this? Oven? I would try pan frying. not entirely true, if you sear it hot you will get more or less the same reaction as you would on the grill. The trick with most beef is fast and hot sear or low and slow. Pan frying works out perfectly fine. Just ensure that you slice your meat on a bias, after resting. VERY tender. We are apartment dwellers as well and I would not be able to live without my George Foreman grill! For real! I love it! Thank God I found you. I mean that sincerely. I lost 52 pounds on WW, but have had several months of NOT doing well. I've gained a few pounds back, and want to get back to what I know is right for me. This blog is awesome! I can't wait to pick your brain. Mine always gets chewy from grilling even though it's still pink in the middle. Any suggestions? High heat vs low heat, etc. I always use meat tenderizer with my flank steak. I sprinkle it all over both sides of the meat and then stab it with a fork all over before I put it in the marinade. I've never had a chewy steak that way. Which way did you slice the meat? If you slice with the grain, it will be horribly chewy and tough. Amazingly, though, if you slice across the grain it becomes as tender as any steak I've ever had. It must be fate...I saw this picture on Pinterest and had to get the recipe...who would have known it would have points values!! Thank you!! Hope you like this recipe. It is very tasty! If you can't grill this what is another option? Want to impress! You can try broiling or pan frying if you like. How long would you suggest broiling? if I decide to pan fry it would you suggest cutting it after? I broil my flank steak 6 minutes on one side and 7 minutes on the other depending on thickness. This leaves the thicker ends slightly more pink and the thinner edges more towards well done. Yikes! for flank steak, I want it VERY rare! to be more tender! Seriously GOOD!Once again, Pinterest delivers. 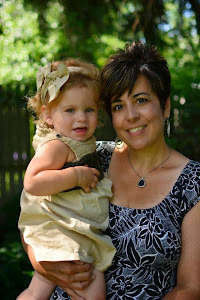 My mom just started WW so your blog will be a sheer delight! Thanks. I would try broiling for 5-7 minutes per side. Then check and see if it is done enough for you. I would still let it stand, covered loosely with foil for 10 minutes. It will also cook a little more that way. Thank- you! I am glad you enjoyed it and I hope your mom finds many useful recipes from this site! You cut the steak 10 minutes after cooking. I hope you like it! This looks so good! 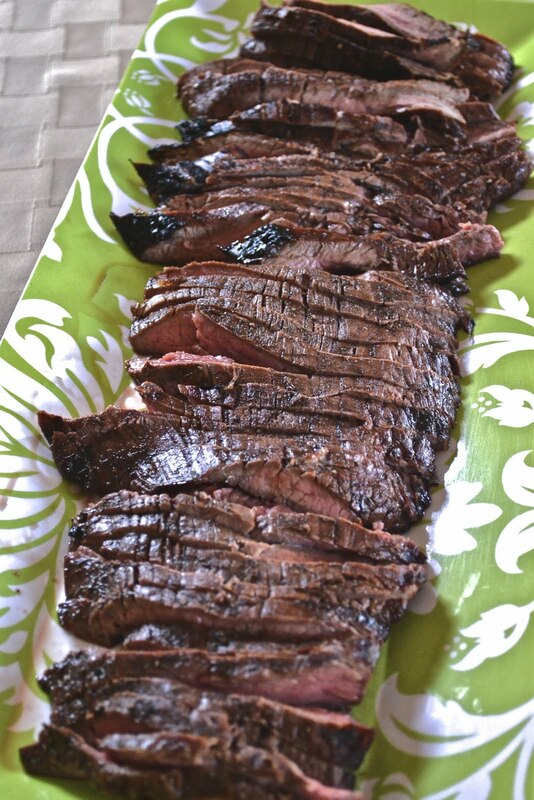 I have flank steak in my fridge just waiting for this recipe tonight! What do you mean when you write the + after the point value? Thanks! the + after the points value is based on the new Weight Watcher's system that came out last year called "Points Plus". The plus is to distinguish this system from the old points system. Saw this on Pintsrest as well and bought the steak today. It's winter here in Wisconsin so grilling is not the best option. I had figured on broiling and hadn't thought of pan frying. Either way my mouth is watering in anticipation. The "Unknown" post from 1-27 is me. I made this for dinner tonight. I have to admit that I'm a little sad. The flavor just wasn't there for me. Don't get me wrong; it was good but didn't wow me with the flavor. Maybe I needed to marinate longer? I did let it sit in the bag, on the counter, for about 40 minutes. I also had a 2.97lb steak so I tripled the marinade recipe. I put it under the broiler for 7 minutes each side and it came out somewhere between medium and medium well. So broiler worked great in lieu of a grill. Sorry you were disappointed in the recipe. We did like it as have most of the others who have tried it, but everyone has different tastes. Maybe you can adjust spices to your liking next time. I am glad to know that a broiler worked well for this recipe, though! I made this tonight. It was delicious! Thanks for posting this. I will be trying out some of your other recipes! The best flank steak marinade. Ever! 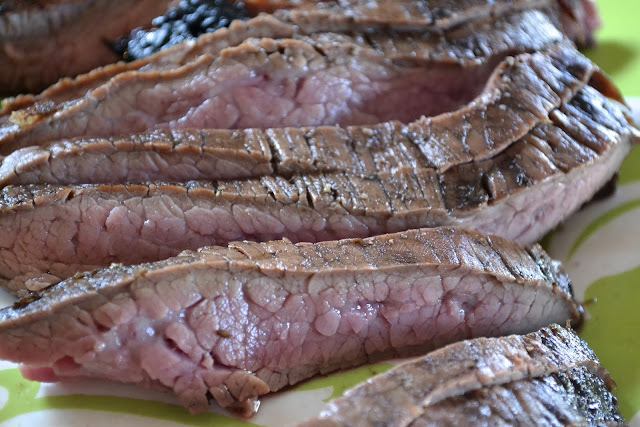 My family has a "secret" recipe for flank steak that has lasted ages. I've now turned them on to this simpler recipe and its winning my older family members over! I can't believe how easy and delicious this was. I did add a sprig of fresh rosemary to the mix while the meat was marinating. It really enhanced the flavor. Also, I marinated the meat overnight. I don't think 30 minutes before cooking is enough to really bring out all the flavors. Just my two cents! Glad you like this recipe. Thank you for your helpful hints as well! Did you grill it wrapped in the foil? No. It was not grilled wrapped in foil. I am making this tonight with a cut of meat called arracherra, here in Mexico. It is close to flank steak but thinner and super tender. I'll be cooking it on my George Foreman! THANKS! oh, I found your recipe on Pinterest! You can marinade this for a day or two, for added tenderness! Just found you thanks to Pinterest! Can't wait to try this menu! Tell me what you used for marinating. Looks yummy! Mmm.. found this recipe on Pinterest and made it for dinner tonight! I live alone and love to cook, but sometimes I'm just not up for a super lengthy process - this was short, easy and completely delish! Thanks!! Nice recipe! Thank you for sharing it. I'm featuring it in my News of the Day today, together with a link to your blog post. Beautiful meat, looks like you had a fantastic meal! I'm going to make this for when my daughter visits next week! So glad I found you on Pinterest! A food trick I learned in Italy was to pour some olive oil over the steak after you slice it. It brings out so many flavors! When does the salt and pepper from the ingredients come to play in the preparation? sprinkle with salt and pepper after removing from marinade and before grilling. That's what I ended up doing! Thanks for a great recipe! It turned out amazingly delicious and simple! Would I be able to bake it? You could try broiling it. I'm excited to try this. However, is it easy to figure out which way the grain is going? I'm scared I'll cut it the wrong way. Look at the picture above. The direction the lines are going in the meat is the grain of the meat. Cut across the grain instead of with the grain. Hope that helps. Just made this for dinner and it was super good. Thanks for the recipe! I do not think it would have the same effect, but you can try it and let me know how it turns out! yes, a barbecue grill or indoor grill ( such as a George Foreman) or a grill pan on the stove. Let me know how it turns out broiled. Looks so good and i want to make it however, i only have chuck steak will this recipe work with it?